Croscarmellose sodium, colloidal Silicon dioxide, microcrystalline cellulose, spray dried Mannitol (Mannogem), magnesium stearate, opadry II yellow. 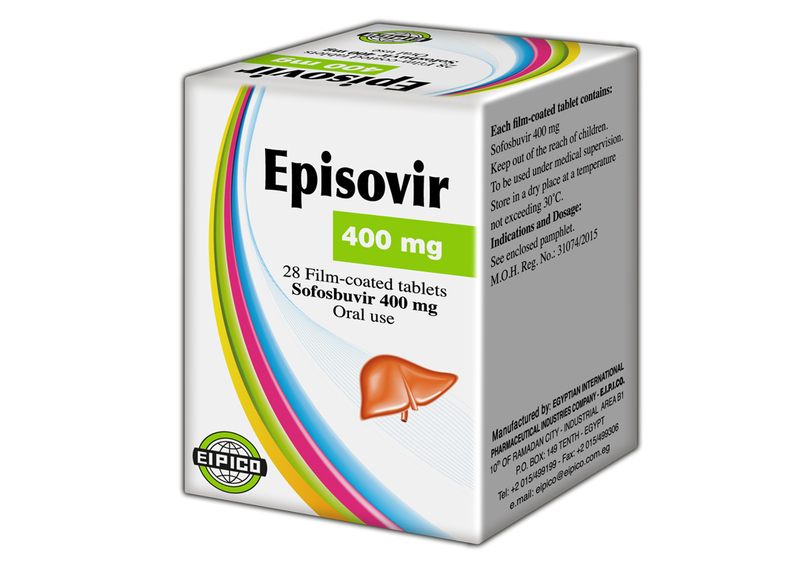 Episovir is indicated in combination with other medicinal products for the treatment of chronic hepatitis C (CHC) in adults. For hepatitis C virus (HCV) genotype specific activity, see Warnings and Precautions. Episovir treatment should be initiated and monitored by a physician experienced in the management of patients with CHC. The recommended dose is one 400 mg tablet, taken orally, once daily with food. Episovir should be used in combination with other medicinal products. Monotherapy of Episovir is not recommended. Refer also to the pamphlet of the medicinal products that are used in combination with Episovir. The recommended co-administered medicinal product(s) and treatment duration for Episovir combination therapy are provided in Table 1. Only for use in patients ineligible or intolerant to peginterferon alfa. a. For previously-treated patients with HCV genotype 1 infection, no data exists with the combination of Episovir, ribavirin and peginterferon alfa. The dose of ribavirin, when used in combination with Episovir is weight-based (< 75 kg = 1,000 mg and ≥ 75 kg = 1,200 mg) and administered orally in two divided doses with food. Concerning co-administration with other direct-acting antivirals against HCV, see Warnings and Precautions. Dose reduction of Episovir is not recommended. If Episovir is used in combination with peginterferon alfa, and a patient has a serious adverse reaction potentially related to this drug, the peginterferon alfa dose should be reduced or discontinued. Refer to the peginterferon alfa pamphlet for additional information about how to reduce and/or discontinue the peginterferon alfa dose. If a patient has a serious adverse reaction potentially related to ribavirin, the ribavirin dose should be modified or discontinued, if appropriate, until the adverse reaction abates or decreases in severity. Table 2 provides guidelines for dose modifications and discontinuation based on the patient's haemoglobin concentration and cardiac status. If the other medicinal products used in combination with Episovir are permanently discontinued, Episovir should also be discontinued. No dose adjustment is warranted for elderly patients. No dose adjustment of Episovir is required for patients with mild or moderate renal impairment. The safety and appropriate dose of sofosbuvir have not been established in patients with severe renal impairment (estimated glomerular filtration rate [eGFR] < 30 mL/min/1.73 m2) or end stage renal disease (ESRD) requiring haemodialysis (see Pharmacokinetic properties). No dose adjustment of Episovir is required for patients with mild, moderate or severe hepatic impairment (Child-Pugh-Turcotte [CPT] class A, B or C). The safety and efficacy of sofosbuvir have not been established in patients with decompensated cirrhosis. The duration of administration of Episovir in patients awaiting liver transplantation should be guided by an assessment of the potential benefits and risks for the individual patient. Episovir in combination with ribavirin is recommended for 24 weeks in liver transplant recipients. A starting ribavirin dose of 400 mg administered orally in two divided doses with food is recommended. If the starting dose of ribavirin is well-tolerated, the dose can be titrated up to a maximum of 1,000-1,200 mg daily (1,000 mg for patients weighing < 75 kg and 1,200 mg for patients weighing ≥ 75 kg). If the starting dose of ribavirin is not well-tolerated, the dose should be reduced as clinically indicated based on haemoglobin levels (see Pharmacodynamic properties). The safety and efficacy of sofosbuvir in children and adolescents aged < 18 years have not yet been established. No data are available. The film coated tablet is for oral use. Patients should be instructed to swallow the tablet whole. The film coated tablet should not be chewed or crushed, due to the bitter taste of the active substance. The tablet should be taken with food. Patients should be instructed that if vomiting occurs within 2 hours of dosing, an additional tablet should be taken. If vomiting occurs more than 2 hours after dosing, no further dose is needed. These recommendations are based on the absorption kinetics of sofosbuvir and GS-331007 (predominant inactive metabolite) suggesting that the majority of the dose is absorbed within 2 hours after dosing. If a dose is missed and it is within 18 hours of the normal time, patients should be instructed to take the tablet as soon as possible and then patients should take the next dose at the usual time. If it is after 18 hours, then patients should be instructed to wait and take the next dose at the usual time. Patients should be instructed not to take a double dose. Medicinal products that are potent P-glycoprotein (P-gp) inducers in the intestine (rifampicin, rifabutin, St. John's wort [Hypericum perforatum], carbamazepine, phenobarbital and phenytoin). Co-administration will significantly decrease sofosbuvir plasma concentration and could result in loss of efficacy of Episovir (See Drug interactions). Postmarketing cases of symptomatic bradycardia and cases requiring pacemaker intervention have been reported when amiodarone is co-administered with sofosbuvir in combination with an investigational agent (NS5A inhibitor) or simeprevir. A fatal cardiac arrest was reported in a patient receiving a sofosbuvir-containing regimen (ledipasvir/sofosbuvir). Bradycardia has generally occurred within hours to days, but cases have been observed up to 2 weeks after initiating HCV treatment. Patients also taking beta blockers, or those with underlying cardiac comorbidities and/or advanced liver disease may be at increased risk for symptomatic bradycardia with co-administration of amiodarone. Bradycardia generally resolved after discontinuation of HCV treatment. The mechanism for this effect is unknown. Co-administration of amiodarone with sofosbuvir in combination with another direct acting antiviral (DAA) is not recommended. - Counsel patients about the risk of serious symptomatic bradycardia. - Cardiac monitoring in an in-patient setting for the first 48 hours of co-administration is recommended, after which outpatient or self-monitoring of the heart rate should occur on a daily basis through at least the first 2 weeks of treatment. Patients who are taking sofosbuvir in combination with another DAA who need to start amiodarone therapy due to no other alternative, viable treatment options should undergo similar cardiac monitoring as outlined above. Due to amiodarone’s long half-life, patients discontinuing amiodarone just prior to starting sofosbuvir in combination with a DAA should also undergo similar cardiac monitoring as outlined above. Patients who develop signs or symptoms of bradycardia should seek medical evaluation immediately. Symptoms may include near-fainting or fainting, dizziness or lightheadedness, malaise, weakness, excessive tiredness, shortness of breath, chest pains, confusion or memory problems. Episovir is not recommended for administration as monotherapy and should be prescribed in combination with other medicinal products for the treatment of hepatitis C infection. If the other medicinal products used in combination with Episovir are permanently discontinued, Episovir should also be discontinued. Consult the pamphlet for co-prescribed medicinal products before starting therapy with Episovir. Sofosbuvir has not been studied in a Phase 3 study in treatment-experienced patients with genotype 1, 4, 5 and 6 HCV infection. Thus, the optimal treatment duration in this population has not been established. The clinical data to support the use of sofosbuvir in patients with genotype 5 and 6 HCV infection is very limited. Interferon-free regimens for patients with genotype 1, 4, 5 and 6 HCV infection with sofosbuvir have not been investigated in Phase 3 studies. The optimal regimen and treatment duration have not been established. Such regimens should only be used for patients that are intolerant to or ineligible for interferon therapy, and are in urgent need of treatment. Episovir should only be co-administered with other direct-acting antiviral medicinal products if the benefit is considered to outweigh the risks based upon available data. There are no data to support the co-administration of sofosbuvir and telaprevir or boceprevir. Such co-administration is not recommended. When Episovir is used in combination with ribavirin or peginterferon alfa/ribavirin, women of childbearing potential or their male partners must use an effective form of contraception during the treatment and for a period of time after the treatment as recommended in the pamphlet of ribavirin. Refer to the pamphlet of ribavirin for additional information. Medicinal products that are moderate P-gp inducers in the intestine (e.g. oxcarbazepine and modafinil) may decrease sofosbuvir plasma concentration leading to reduced therapeutic effect of Episovir. Co-administration of such medicinal products is not recommended with Episovir. The safety of sofosbuvir has not been assessed in subjects with severe renal impairment (eGFR < 30 mL/min/1.73 m2) or ESRD requiring haemodialysis. Furthermore, the appropriate dose has not been established. When Episovir is used in combination with ribavirin or peginterferon alfa/ribavirin, refer also to the pamphlet of ribavirin for patients with creatinine clearance (CrCl) < 50 mL/min. Cases of hepatitis B virus (HBV) reactivation, some of them fatal, have been reported during or after treatment with direct-acting antiviral agents. HBV screening should be performed in all patients before initiation of treatment. HBV/HCV co-infected patients are at risk of HBV reactivation, and should therefore be monitored and managed according to current clinical guidelines. Episovir is not recommended for use in children and adolescents under 18 years of age, because the safety and efficacy of sofosbuvir have not been established in this population. Sofosbuvir is a nucleotide prodrug. After oral administration of Episovir, sofosbuvir is rapidly absorbed and subject to extensive first-pass hepatic and intestinal metabolism. Intracellular hydrolytic prodrug cleavage catalysed by enzymes including carboxylesterase 1 and sequential phosphorylation steps catalysed by nucleotide kinases result in formation of the pharmacologically active uridine nucleoside analogue triphosphate. The predominant inactive circulating metabolite GS-331007 that accounts for greater than 90% of drug-related material systemic exposure, is formed through pathways sequential and parallel to formation of active metabolite. The parent sofosbuvir accounts for approximately 4% of drug-related material systemic exposure. (see Pharmacokinetic properties). In clinical pharmacology studies, both sofosbuvir and GS-331007 were monitored for purposes of pharmacokinetic analyses. Medicinal products that are potent P-gp inducers in the intestine (e.g. rifampicin, St. John's wort, carbamazepine and phenytoin) may decrease sofosbuvir plasma concentration leading to reduced therapeutic effect of Episovir and thus should not be used with Episovir. Co-administration of Episovir with medicinal products that inhibit P-gp and/or BCRP may increase sofosbuvir plasma concentration without increasing GS-331007 plasma concentration, thus Episovir may be co-administered with P-gp and/or BCRP inhibitors. Sofosbuvir and GS-331007 are not inhibitors of P-gp and BCRP and thus are not expected to increase exposures of medicinal products that are substrates of these transporters. The intracellular metabolic activation pathway of sofosbuvir is mediated by generally low affinity and high capacity hydrolase and nucleotide phosphorylation pathways that are unlikely to be affected by concomitant medicinal products. As liver function may change during treatment with Episovir, a close monitoring of International Normalised Ratio (INR) values is recommended. Drug interaction information for sofosbuvir with potential concomitant medicinal products is summarised in Table 3 below (where 90% confidence interval (CI) of the geometric least-squares mean (GLSM) ratio were within “↔”, extended above “↑”, or extended below “↓” the predetermined equivalence boundaries). The table is not all-inclusive. Co-administration of Episovir with modafinil is expected to decrease the concentration of sofosbuvir, leading to reduced therapeutic effect of Episovir. Such co-administration is not recommended. Use only if no other alternative is available. Close monitoring is recommended if this medicinal product is administered with Episovir and another DAA. Close monitoring of INR is recommended with all vitamin K antagonists. This is due to liver function changes during treatment with Episovir. Episovir is contraindicated with carbamazepine, phenobarbital and phenytoin, potent intestinal P-gp inducers. Co-administration of Episovir with oxcarbazepine is expected to decrease the concentration of sofosbuvir, leading to reduced therapeutic effect of Episovir. Such co-administration is not recommended. Episovir is contraindicated with rifampicin, a potent intestinal P-gp inducer. Episovir is contraindicated with rifabutin, a potent intestinal P-gp inducer. Co-administration of Episovir with rifapentine is expected to decrease the concentration of sofosbuvir, leading to reduced therapeutic effect of Episovir. Such co-administration is not recommended. Episovir is contraindicated with St. John's wort, a potent intestinal P-gp inducer. No drug-drug interaction data exists regarding the co-administration of sofosbuvir with boceprevir or telaprevir. No dose adjustment of Episovir or methadone is required when Episovir and methadone are used concomitantly. No dose adjustment of Episovir or ciclosporin is required when Episovir and ciclosporin are used concomitantly. No dose adjustment of Episovir or tacrolimus is required when Episovir and tacrolimus are used concomitantly. No dose adjustment of Episovir or efavirenz is required when Episovir and efavirenz are used concomitantly. No dose adjustment of Episovir or emtricitabine is required when Episovir and emtricitabine are used concomitantly. No dose adjustment of Episovir or tenofovir disoproxil fumarate is required when Episovir and tenofovir disoproxil fumarate are used concomitantly. No dose adjustment of Episovir or rilpivirine is required when Episovir and rilpivirine are used concomitantly. No dose adjustment of Episovir or darunavir (ritonavir boosted) is required when Episovir and darunavir are used concomitantly. No dose adjustment of Episovir or raltegravir is required when Episovir and raltegravir are used concomitantly. No dose adjustment of norgestimate/ethinyl estradiol is required when Episovir and norgestimate/ethinyl estradiol are used concomitantly. NA = not available/not applicable. b. All interaction studies conducted in healthy volunteers. c. Comparison based on historical control. Co-administration of amiodarone with sofosbuvir in combination with another DAA may result in serious symptomatic bradycardia. The mechanism of this effect is unknown. Co-administration of amiodarone with Episovir in combination with another DAA is not recommended; if coadministration is required, cardiac monitoring is recommended. When Episovir is used in combination with ribavirin or peginterferon alfa/ribavirin, extreme care must be taken to avoid pregnancy in female patients and in female partners of male patients. Significant teratogenic and/or embryocidal effects have been demonstrated in all animal species exposed to ribavirin. Women of childbearing potential or their male partners must use an effective form of contraception during treatment and for a period of time after the treatment has concluded as recommended in pamphlet of ribavirin. Refer to the pamphlet of ribavirin for additional information. Animal studies do not indicate direct or indirect harmful effects with respect to reproductive toxicity. No effects on fetal development have been observed in rats and rabbits at the highest doses tested. However, it has not been possible to fully estimate exposure margins achieved for sofosbuvir in the rat relative to the exposure in humans at the recommended clinical dose. As a precautionary measure, it is preferable to avoid the use of Episovir during pregnancy. However, if ribavirin is co-administered with sofosbuvir, the contraindications regarding use of ribavirin during pregnancy apply (see also the pamphlet of ribavirin). Available pharmacokinetic data in animals has shown excretion of metabolites in milk. A risk to newborns/infants cannot be excluded. Therefore, Episovir should not be used during breastfeeding. No human data on the effect of sofosbuvir on fertility are available. Animal studies do not indicate harmful effects on fertility. Episovir has moderate influence on the ability to drive and to use machines. Patients should be informed that fatigue and disturbance in attention, dizziness and blurred vision have been reported during treatment with sofosbuvir in combination with peginterferon alfa and ribavirin. During treatment with sofosbuvir in combination with ribavirin or with peginterferon alfa and ribavirin, the most frequently reported adverse drug reactions were consistent with the expected safety profile of ribavirin and peginterferon alfa treatment, without increasing the frequency or severity of the expected adverse drug reactions. The proportion of subjects who permanently discontinued treatment due to adverse reactions was 1.4% for subjects receiving placebo, 0.5% for subjects receiving sofosbuvir + ribavirin for 12 weeks, 0% for subjects receiving sofosbuvir + ribavirin for 16 weeks, 11.1% for subjects receiving peginterferon alfa + ribavirin for 24 weeks and 2.4% for subjects receiving sofosbuvir + peginterferon alfa + ribavirin for 12 weeks. Sofosbuvir has mainly been studied in combination with ribavirin, with or without peginterferon alfa. In this context, no adverse drug reactions specific to sofosbuvir have been identified. The most common adverse drug reactions occurring in subjects receiving sofosbuvir and ribavirin or sofosbuvir, ribavirin and peginterferon alfa were: fatigue, headache, nausea and insomnia. The following adverse drug reactions have been identified with sofosbuvir in combination with ribavirin or in combination with peginterferon alfa and ribavirin (Table 4). The adverse reactions are listed below by body system organ class and frequency. Frequencies are defined as follows: Very common (≥ 1/10), Common (≥ 1/100 to < 1/10), Uncommon (≥ 1/1,000 to < 1/100), Rare (≥ 1/10,000 to < 1/1,000) or Very rare (< 1/10,000). The safety profile of sofosbuvir and ribavirin in HCV/HIV co-infected subjects was similar to that observed in mono-infected HCV subjects treated with sofosbuvir and ribavirin in Phase 3 clinical studies. The safety profile of sofosbuvir and ribavirin in HCV-infected subjects prior to liver transplantation was similar to that observed in subjects treated with sofosbuvir and ribavirin in Phase 3 clinical studies. The safety profile of sofosbuvir and ribavirin in liver transplant recipients with chronic hepatitis C was similar to that observed in subjects treated with sofosbuvir and ribavirin in Phase 3 clinical studies. In study 0126, decreases in haemoglobin during treatment were very common with 32.5% (13/40 subjects) experiencing a decline in haemoglobin to < 10 g/dL, 1 of whom also had a decline to < 8.5 g/dL. Eight subjects (20%) received epoetin and/or a blood product. In 5 subjects (12.5%), study drugs were discontinued, modified or interrupted due to adverse events. Cases of severe bradycardia and heart block have been observed when sofosbuvir is used in combination with another DAA (including daclatasvir, simeprevir and ledipasvir) and concomitant amiodarone and/or other drugs that lower heart rate. The highest documented dose of sofosbuvir was a single supratherapeutic dose of sofosbuvir 1,200 mg administered to 59 healthy subjects. In that study, there were no untoward effects observed at this dose level, and adverse reactions were similar in frequency and severity to those reported in the placebo and sofosbuvir 400 mg treatment groups. The effects of higher doses are unknown. No specific antidote is available for overdose with Episovir. If overdose occurs, the patient must be monitored for evidence of toxicity. Treatment of overdose with Episovir consists of general supportive measures including monitoring of vital signs as well as observation of the clinical status of the patient. Haemodialysis can efficiently remove (53% extraction ratio) the predominant circulating metabolite GS-331007. A 4-hour haemodialysis session removed 18% of the administered dose. Sofosbuvir is a pan-genotypic inhibitor of the HCV NS5B RNA-dependent RNA polymerase, which is essential for viral replication. Sofosbuvir is a nucleotide prodrug that undergoes intracellular metabolism to form the pharmacologically-active uridine analog triphosphate (GS-461203), which can be incorporated into HCV RNA by the NS5B polymerase and acts as a chain terminator. In a biochemical assay, GS-461203 inhibited the polymerase activity of the recombinant NS5B from HCV genotype 1b, 2a, 3a and 4a with a 50% inhibitory concentration (IC50) value ranging from 0.7 to 2.6 μM. GS-461203 (the active metabolite of sofosbuvir) is not an inhibitor of human DNA and RNA polymerases nor an inhibitor of mitochondrial RNA polymerase. In HCV replicon assays, the effective concentration (EC50) values of sofosbuvir against full-length replicons from genotype 1a, 1b, 2a, 3a and 4a were 0.04, 0.11, 0.05, 0.05 and 0.04 μM, respectively, and EC50 values of sofosbuvir against chimeric 1b replicons encoding NS5B from genotype 2b, 5a or 6a were 0.014 to 0.015 μM. The mean ± SD EC50 of sofosbuvir against chimeric replicons encoding NS5B sequences from clinical isolates was 0.068 ± 0.024 μM for genotype 1a (n = 67), 0.11 ± 0.029 μM for genotype 1b (n = 29), 0.035 ± 0.018 μM for genotype 2 (n = 15) and 0.085 ± 0.034 μM for genotype 3a (n = 106). In these assays, the in vitro antiviral activity of sofosbuvir against the less common genotypes 4, 5 and 6 was similar to that observed for genotypes 1, 2 and 3. HCV replicons with reduced susceptibility to sofosbuvir have been selected in cell culture for multiple genotypes including 1b, 2a, 2b, 3a, 4a, 5a and 6a. Reduced susceptibility to sofosbuvir was associated with the primary NS5B substitution S282T in all replicon genotypes examined. Site-directed mutagenesis of the S282T substitution in replicons of 8 genotypes conferred 2- to 18-fold reduced susceptibility to sofosbuvir and reduced the replication viral capacity by 89% to 99% compared to the corresponding wild-type. In biochemical assays, recombinant NS5B polymerase from genotypes 1b, 2a, 3a and 4a expressing the S282T substitution showed reduced susceptibility to GS-461203 compared to respective wild-types. Baseline NS5B sequences were obtained for 1,292 subjects from Phase 3 studies by population sequencing and the S282T substitution was not detected in any subject with available baseline sequence. In an analysis evaluating the effect of baseline polymorphisms on treatment outcome, no statistically significant association was observed between the presence of any HCV NS5B variant at baseline and treatment outcome. HCV replicons expressing the sofosbuvir-associated resistance substitution S282T were fully susceptible to other classes of anti-HCV agents. Sofosbuvir retained activity against the NS5B substitutions L159F and L320F associated with resistance to other nucleoside inhibitors. Sofosbuvir was fully active against substitutions associated with resistance to other direct-acting antivirals with different mechanisms of actions, such as NS5B non-nucleoside inhibitors, NS3 protease inhibitors and NS5A inhibitors. The European Medicines Agency has deferred the obligation to submit the results of studies with sofosbuvir in one or more subsets of the pediatric populations in the treatment of chronic hepatitis C.
Sofosbuvir is a nucleotide prodrug that is extensively metabolised. The active metabolite is formed in hepatocytes and not observed in plasma. The predominant (> 90%) metabolite, GS-331007, is inactive. It is formed through sequential and parallel pathways to the formation of active metabolite. The pharmacokinetic properties of sofosbuvir and the predominant circulating metabolite GS-331007 have been evaluated in healthy adult subjects and in subjects with chronic hepatitis C.
Following oral administration, sofosbuvir was absorbed quickly and the peak plasma concentration was observed ~ 0.5-2 hour post-dose, regardless of dose level. Peak plasma concentration of GS-331007 was observed between 2 to 4 hours post-dose. Based on population pharmacokinetic analysis in subjects with genotypes 1 to 6 HCV infection (n = 986), steady-state AUC0-24 for sofosbuvir and GS-331007 was 1,010 ng•h/mL and 7,200 ng•h/mL, respectively. Relative to healthy subjects (n = 284), the sofosbuvir and GS-331007 AUC0-24 was 57% higher and 39% lower, respectively in HCV infected subjects. Relative to fasting conditions, the administration of a single dose of sofosbuvir with a standardised high fat meal slowed the rate of absorption of sofosbuvir. The extent of absorption of sofosbuvir was increased approximately 1.8-fold, with little effect on peak concentration. The exposure to GS-331007 was not altered in the presence of a high-fat meal. Sofosbuvir is not a substrate for hepatic uptake transporters, organic anion transporting polypeptide (OATP) 1B1 or 1B3, and organic cation transporter (OCT) 1. While subject to active tubular secretion, GS- 331007 is not a substrate for renal transporters including organic anion transporter (OAT) 1 or 3, OCT2, MRP2, P gp, BCRP or MATE1. Sofosbuvir and GS-331007 are not inhibitors of drug transporters P gp, BCRP, MRP2, BSEP, OATP1B1, OATP1B3 and OCT1. GS-331007 is not an inhibitor of OAT1, OCT2, and MATE1. Sofosbuvir is approximately 85% bound to human plasma proteins (ex vivo data) and the binding is independent of drug concentration over the range of 1 µg/mL to 20 µg/mL. Protein binding of GS-331007 was minimal in human plasma. After a single 400 mg dose of [14C]-sofosbuvir in healthy subjects, the blood to plasma ratio of 14C-radioactivity was approximately 0.7. Sofosbuvir is extensively metabolised in the liver to form the pharmacologically active nucleoside analog triphosphate GS-461203. The metabolic activation pathway involves sequential hydrolysis of the carboxyl ester moiety catalysed by human cathepsin A (CatA) or carboxylesterase 1 (CES1) and phosphoramidate cleavage by histidine triad nucleotide-binding protein 1 (HINT1) followed by phosphorylation by the pyrimidine nucleotide biosynthesis pathway. Dephosphorylation results in the formation of nucleoside metabolite GS-331007 that cannot be efficiently rephosphorylated and lacks anti-HCV activity in vitro. Sofosbuvir and GS-331007 are not substrates or inhibitors of UGT1A1 or CYP3A4, CYP1A2, CYP2B6, CYP2C8, CYP2C9, CYP2C19, and CYP2D6 enzymes. After a single 400 mg oral dose of [14C]-sofosbuvir, sofosbuvir and GS-331007 accounted for approximately 4% and > 90% of drug-related material (sum of molecular weight-adjusted AUC of sofosbuvir and its metabolites) systemic exposure, respectively. Following a single 400 mg oral dose of [14C]-sofosbuvir, mean total recovery of the dose was greater than 92%, consisting of approximately 80%, 14%, and 2.5% recovered in urine, faeces, and expired air, respectively. The majority of the sofosbuvir dose recovered in urine was GS-331007 (78%) while 3.5% was recovered as sofosbuvir. This data indicate that renal clearance is the major elimination pathway for GS-331007 with a large part actively secreted. The median terminal half-lives of sofosbuvir and GS-331007 were 0.4 and 27 hours respectively. The dose linearity of sofosbuvir and its primary metabolite, GS-331007, was evaluated in fasted healthy subjects. Sofosbuvir and GS-331007 AUCs are near dose proportional over the dose range of 200 mg to 400 mg.
Population pharmacokinetic analysis in HCV-infected subjects showed that within the age range (19 to 75 years) analysed, age did not have a clinically relevant effect on the exposure to sofosbuvir and GS-331007. Clinical studies of sofosbuvir included 65 subjects aged 65 and over. The response rates observed for subjects over 65 years of age were similar to that of younger subjects across treatment groups. The pharmacokinetics of sofosbuvir were studied in HCV negative subjects with mild (eGFR ≥ 50 and < 80 mL/min/1.73 m2), moderate (eGFR ≥ 30 and < 50 mL/min/1.73 m2), severe renal impairment (eGFR < 30 mL/min/1.73 m2) and subjects with ESRD requiring haemodialysis following a single 400 mg dose of sofosbuvir. Relative to subjects with normal renal function (eGFR > 80 mL/min/1.73 m2), the sofosbuvir AUC0-inf was 61%, 107% and 171% higher in mild, moderate and severe renal impairment, while the GS-331007 AUC0-inf was 55%, 88% and 451% higher, respectively. In subjects with ESRD, relative to subjects with normal renal function, sofosbuvir AUC0-inf was 28% higher when sofosbuvir was dosed 1 hour before haemodialysis compared with 60% higher when sofosbuvir was dosed 1 hour after haemodialysis. The AUC0-inf of GS-331007 in subjects with ESRD could not be reliably determined. However, data indicate at least 10-fold and 20-fold higher exposure to GS-331007 in ESRD compared to normal subjects when sofosbuvir was administered 1 hour before or 1 hour after haemodialysis, respectively. Haemodialysis can efficiently remove (53% extraction ratio) the predominant circulating metabolite GS-331007. A 4-hour haemodialysis session removed approximately 18% of administered dose. No dose adjustment is required for patients with mild or moderate renal impairment. The safety of sofosbuvir has not been assessed in patients with severe renal impairment or ESRD. (See Warnings and Precautions). The pharmacokinetics of sofosbuvir were studied following 7-day dosing of 400 mg sofosbuvir in HCV-infected subjects with moderate and severe hepatic impairment (CPT class B and C). Relative to subjects with normal hepatic function, the sofosbuvir AUC0-24 was 126% and 143% higher in moderate and severe hepatic impairment, while the GS-331007 AUC0-24 was 18% and 9% higher, respectively. Population pharmacokinetics analysis in HCV-infected subjects indicated that cirrhosis had no clinically relevant effect on the exposure to sofosbuvir and GS-331007. No dose adjustment of sofosbuvir is recommended for patients with mild, moderate and severe hepatic impairment. The pharmacokinetics of sofosbuvir and GS-331007 in pediatric subjects have not been established. Efficacy, in terms of rapid virologic response, has been shown to correlate with exposure to sofosbuvir as well as GS-331007. However, neither of these entities has been evidenced to be a general surrogate marker for efficacy (SVR12) at the therapeutic 400 mg dose. Store in a dry place at a temperature not exceeding 30°C. EPISOVIR Film coated Tablets: Box containing 1 white bottle of 28 film coated tablets with polypropylene continuous thread child resistant cap + cotton piece + 2 silica gel desiccant.